What do you think of the new Toyota Corolla sedan? Striking isn’t it? Today’s simultaneous launch in the US, Europe and China revealed different masks for each major market. In China’s case, there are two looks – one for the Toyota Corolla and another for the Toyota Levin. Let’s compare the different looks. Like other major foreign brands in China, Toyota has two local joint ventures – GAC Toyota and FAW Toyota – and each has their own version of the Corolla. GAC Toyota’s is called Levin, and as with the outgoing car, the new Levin is sportier in appearance compared to FAW Toyota’s version, which is simply called Corolla. The former’s looks goes well with its more evocative name. The Levin’s face – which will also be found on the Corolla sedans sold in Japan and other markets – is similar in style, but not identical to the aggressive mug of the Corolla Hatchback and Touring Sports wagon that were revealed earlier this year. It’s made up of slim headlamps with long vertical “fangs” at the sides, and a huge lower grille with honeycomb mesh and fog lamps at the lower ends. Now that your eyes are there, note that the lower ends of the mouth don’t fold back in sharply on the Levin, and it doesn’t get the hatchback’s “floating” body-coloured chin either. Upon closer inspection, the Levin’s grille also loses out on the V-shape trim surrounding the Toyota logo – it’s just mesh here. The area to the side of the hatchback’s “mouth” is empty, but there’s a small notch mimicking an intake on the Levin – seen head-on, the latter further emphasises width versus the hatch. 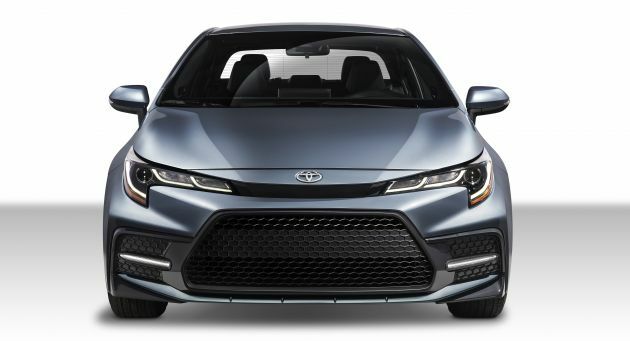 Meanwhile, the European- and Chinese-market Corolla is less overtly sporty than the Levin, and it takes more of a mini-Camry look – however, that’s not to say that it’s “uncle”, because the latest “Beautiful Monster” Camry looks very aggressive. The headlamps are completely different from the Levin’s – they’re shorter but cut sharper, and there’s interplay with the chrome “wings” of the Toyota logo, which travels deep into the clusters. A defining cue at the rear end is the bridge between the tail lamp clusters. On the Levin, the gloss black trim connects the top of the lights, while on the Corolla, it’s a chrome garnish that “supports” the bottom. The sportier sister gets a big gloss black area on the lower bumper, punctuated by a body-coloured strip. The US-market Corolla is something else altogether. We’re used to seeing North American Toyotas looking sportier than what the rest of the world gets, but this is unprecedented aggression for a 2.0 litre C-segment family sedan. Never mind that there’s just 169 hp under the hood, it looks like an absolute beast. While the headlamps with those distinctive triple curve LED daytime running lights are as per the hatchback, the slim grille that bridges the eyes does not house the Toyota logo here. Instead, the emblem sits above the grille on a body-coloured island. Without the T-badge, the slim grille becomes visually separated from the lower grille. The bumper is also unique to the sportiest US-market sedan. While the hatchback and Levin have fog lamps within the “mouth”, the US sedan sports side air-intake style extensions to the mouth (all fake, of course), and they house horizontal LED fog lamp strips. There’s a full-length body-coloured chin spoiler as well. At the back, the most extrovert 12th-gen Corolla features a slim bootlid spoiler and a large black honeycomb section on the bumper. Within the latter, there’s a body-coloured “diffuser” with four fins to match those on the front chin. It’s also the only sedan variation with exposed exhaust tips – there are two on one side. There you have it, the one car, three looks of the all-new 12th generation Toyota Corolla sedan. Which will we be getting as the Toyota Corolla Altis for ASEAN? Car guys might like the hyper-aggressive USDM look, but a Corolla needs to appeal to a wide segment of buyers, and that mask is too anti-social. Our money is on something similar to the European- and Chinese-market Corolla, which balances “high-end” with “aggressive” pretty well, despite officially bearing the “Prestige model” name. The “Sporty model” look of the Levin would be a good option to have, but options are for big markets. For figures and full details, check out our earlier report. What do you think of the new Corolla? Based on looks and that nice minimalist interior alone, this or the Honda Civic? Wow, the world’s best selling car has got even better. This car comes to Malaysia will sell like hot cakes. No wonder our regular Toyota bashers here, john and Mario and Bros are hiding today. They don’t know where to hide their face. Toyota does not need RM20 billion bailout by the Government to keep the company alive the past 20 yrs. Toyota also bailout seeker last time, so…. I buy toyota if corolla prestige model come to malaysia. I don’t care what honda fanboy say. I wish Proton on its own knew how to create a good C class sedan like this. Pity we have to have a rebadged Geely car as a Proton to replace our ailing Preve. I wonder what does the Proton workers do in opis when all they do is rebadge? Got headache seeing big mouth, for what? This sedan got turbo? Looks pretty sporty and a bit more “grown up” despite the Anime/mecha lines, and somewhat less “ricer” than the Civic. Unfortunately, if you watch the first looks videos from the US where the new Corolla has been launched in San Francisco, it still doesn’t have rear aircond vents and the rear legroom is quite lacking. Such a shame, considering that the dashboard, meter cluster, steering wheel, etc. all look really great. The XSE does indeed look like a beast.. in those videos you can see that it’s even radiating a sort of Subaru WRX vibe. Aggressive and sporty. Round earth is just a conspiracy, we live in a flat world. This is a fact. The world has gone for global design, even Civic 10 is same design everywhere. Even Geely design now has global appeal. But Toyota designers still caveman thinking and coming out with separate designs, both which sux. What is Toyota designers doing? Tido and minum sake 8x to come out with this sheit? We are almost confirmed to get the Corolla “Prestige” Look not the Levin “Sport” look. Europe Corolla is confirmed to be Prestige variant, and the Corolla sedan variant for Europe and SEA was the same for the previous gen. The rear design is ugly..
Volvo with Thor headlight, Corolla with “kapak” headlight, in a good way. China’s version of the taillights much classy and look premium than the US’s red white old traditional tone.. Simply boring. The most important part is does the new Corolla run on independent rear suspension? Current Civic and Mazda 3 has multilink rear suspension. Not only it handles better, it is more comfortable for passengers as well. Torsion beam should only be used for B segment cars and below, not C segment and above. Previous Post: Subaru XV bakal terima teknologi plug-in hybrid – dengan jarak elektrik sepenuhnya sejauh 41 km? Next Post: Suzuki Jimny DAMD Little G dan Little D – replika skala kecil Land Rover Defender dan Mercedes G Wagen!